You'll not see better impersonations ever. Biopics that depict professional and personal showbusiness relationships can stress the conflicts over the triumphs. Not so director John S. Baird’s Stan & Ollie, where the conflict comes in the form of an aging celebrated partnership from the first half of the twentieth century stage and film world. The most recent biography about actress Gloria Grahame’s professional decline in Film Stars Don’t Die in Liverpool shows still an interest in show-biz has-beens. Stan & Ollie, while lacking the explosive incidents of other biopics, has a slow sweetness like the boys themselves. Sometimes too slow. Although Stan Laurel (Steve Coogan) may have not gotten over Ollie’s trying a new partner, and Ollie has not forgiven Stan for sabotaging their relationship with nettlesome producer Hal Roach (from 1926-1940), they remained friends through it all. Coogan and Reilly are pitch perfect as they impersonate and invest gravity in the famous duo. Their impersonations are among the best you will ever see. In the early 50’s their salad days are behind them as they start an uncomfortable Brit tour to such hot spots as Glasgow, Worthing, and Newcaastle, hoping to get a film contract as they go. Although they begin to get fuller houses after painful promotions, they still are artifacts compared with zany new duos like Abbot & Costello. Ida Laurel (Nina Arianda) and Lucille Hardy (Shirley Henderson), whose banter is at times caustic and at others admiring, a little like the boys themselves. Although sometimes the girls will say what the shy boys repress, no one steps on another—the ensemble works together in harmony on stage and off. The joy is watching Coogan’s impeccable timing, underplaying to inspired Reilly’s flamboyant but sweet reactions. 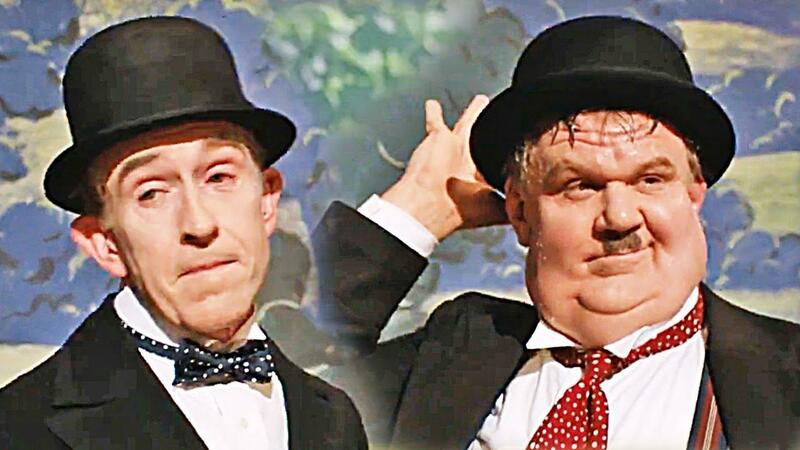 True to this duo’s enduring dynamic, Stan writes the gags and Ollie has the right reactions. Although the film is largely centered on their later career in the early 1950’s, which they try to revive with the Brit tour, their successful younger routines will satisfy Laurel and Hardy fans. Several skits are taken from their history; even the famous piano challenge substitutes a large trunk careening down the stairs. Where in their younger days they would have done Sisyphus with the piano, for the film it is a disposable trunk. Coogan and Reilly reprising the duo’s dance routines is as satisfying as seeing Gene Kelly and Donald O’Connor burning up the screen. Although the team’s simple plots and routines may not lead to film history stardom, these two loving comics will leave you feeling pretty good about old comedy and enduring partnerships.